I spent a good bit of time working out all the bits and pieces needed to make this work, so I’m going to blog about it here as a way of documentation. I wanted to run Gitlab and host my personal code repos myself. Gitlab is a pretty awesome project and the Docker container they provide is the perfect way to run this on my Ubuntu 14.04 server in my basement. I’m a total Docker amateur and this was a good reason to also learn how to manage this with Ansible 2.0. Feel free to tell me what I’m doing wrong in the comments – this is my first guess at the best way to do this and it does work. This will run on an Ubuntu 14.04 server in my basement. This means it is behind my home router and shares an IP address on both my local network and publicly with a bunch of other services, so Gitlab can’t just assume it is the only thing running. This comes into plan when managing the ports Gitlab uses. Some details removed for security, but this is essentially what I run in Ansible. You’ll see that this container will be addressed on the Ubuntu server at port 2225 for SSH, port 8085 for HTTP, and port 4443 for HTTPS. I send environmental variables to Gitlab to use my Mailgun account for sending emails. I use Nginx to proxy_pass HTTP and HTTPS to the Gitlab container. I also do SSL termination here using a LetsEncrypt cert. I use my /etc/hosts file on my Ubuntu server to route traffic for gitlab.thelastcicada.com to 127.0.0.1 so I can access it from this same box. I’ll need to do this on any host that I use to push code to my Gitlab server. I could solve this by having Gitlab use port 22 and setting SSH to the main Ubuntu server to use a different pot, but we’ll see how much of a pain this turns out to be. I haven’t lived with this long enough to know if this is going to be my final configuration. I’ll update this post if I decide that improvements need to be made. PHP 7 is not messing around when it comes to performance. On this WordPress blog you are reading right now, just switching to PHP 7 reduced memory usage in the Media Uploader by 78%! As you may know, I’m running this WordPress multisite install on a $0.99 VM from Atlantic.net. I’ve been super happy with this server (which I’m lucky to have since the deal is no longer available) and have really enjoyed figuring out how to make everything work with only 256M of RAM (see my previous post for more on how I’ve done this). This week, I thought this grand experiment was going to come to an end as I ran into error after error trying to upload multiple images though the WordPress Media Uploader. The WordPress uploader is a known to use quite a bit of memory when using the php-gd library to resize uploaded images. With my puny 256M, it is no wonder I was running into this. 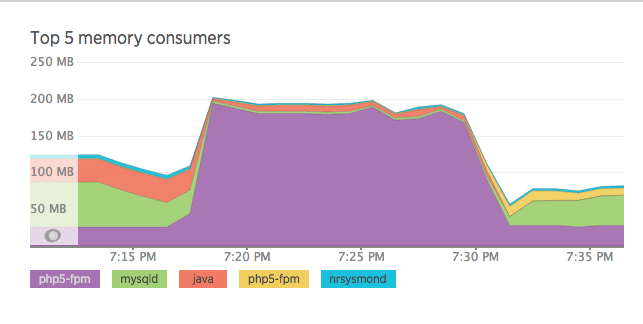 I installed the free New Relic server monitoring to get some pretty graphs of what was going on and, sure enough, PHP 5.5 was going bonkers when I tried to upload multiple images. Don’t have to be a sysadmin to know bad things are happening here. If you look at the Physical memory graph, you can see where this goes bad. Once the red swap space starts growing, it is an indication the machine has filled up the RAM and has started using the disk in a desperate attempt to keep things running. This essentially locks up the server as the disk is nowhere near fast enough for this job. This is what the user experience was in the browser as well – 1 or 2 images would upload, and the rest would fail with a generic “HTTP Error” message in red after doing nothing for many minutes. 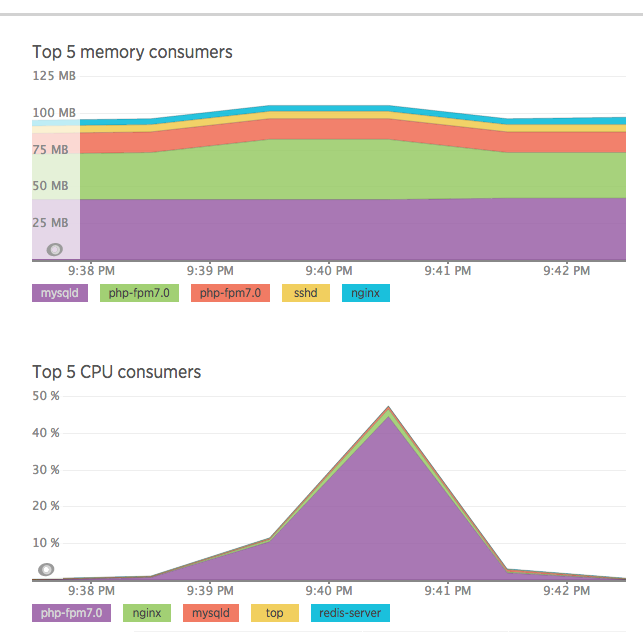 New Relic is pretty great in that you can see exactly what server process has used all your memory, and it confirms what we suspected: PHP is the culprit. php5-fpm struggling to deal with bulk image resizing. I did a lot of optimizing to try to get this memory usage down, including changing the WordPress memory limit, the PHP memory limit, and fiddling with the caching settings. Nothing made a difference. I started looking for other things I could try and seriously considered just upgrading to the $4.97 per month VM with 512M of RAM. But I came across this article about Symphony framework and how much less memory certain code used on PHP 7 compared to PHP 5.6 and thought the upgrade was worth a shot. It was a little bit messy getting PHP 7 on Ubuntu and I longed for CentOS 7 where I could use the excellent Remi repo, but using a Digital Ocean tutorial, I was able to get PHP upgraded and was ready to run another test. You can see the CPU spike as PHP 7 processes the images, but there’s hardly a bump in the RAM usage at all. 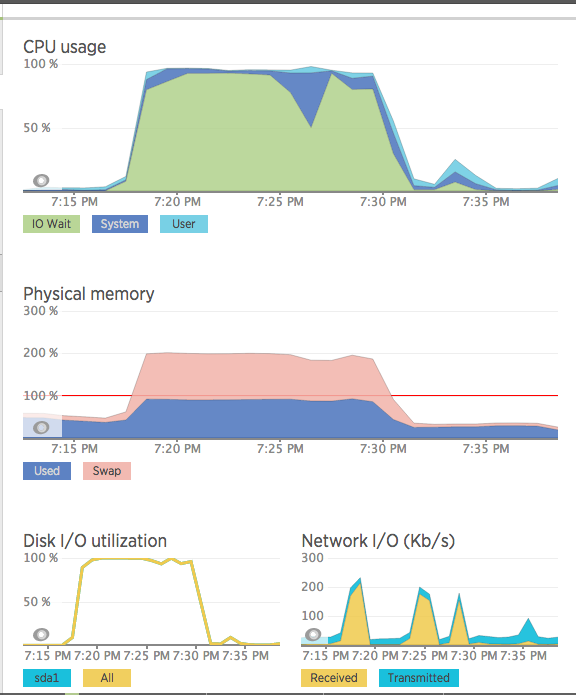 According to New Relic, PHP 7 used a maximum of 41 MB to process the dozen images I threw at it. With PHP 5.5, memory usage topped out at 190 MB for the same job. That’s an incredible improvement and it allows me to keep enjoying my $0.99 VM! I knew PHP 7 was good, but I had no idea I’d see gains this dramatic. 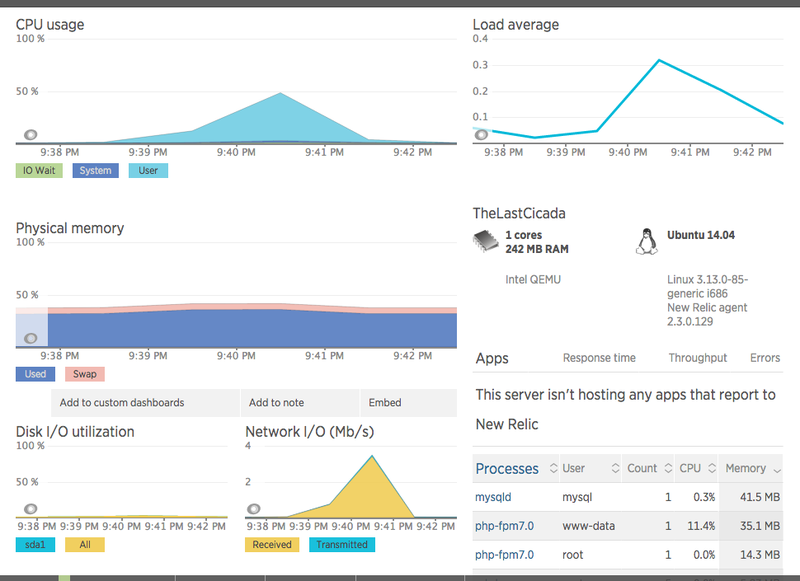 If you run a WordPress server, go install PHP 7 right now – I’m a believer. I’ll be giving a presentation on November 19, 2015 on using New Relic with WordPress at our local WordPress meetup. The presentation will be posted here after the talk. I’ve been a big fan of Digital Ocean and their $5 Droplets (aka Virtual Machines). They are 100% SSD backed and speedy, and for $5 a month, you can afford to experiment. But when I borked my Droplet by screwing up a kernel update, I started thinking…. can I do this any cheaper than $5 per month? This is when I discovered atlantic.net and their “GO” VPS package for $0.99 per month. $0.99! I had to try this out. Admittedly, the 10 GB of disk space and 256 MB of RAM is pretty tight, but I am strangely drawn to challenges of efficiency and really enjoy doing a lot with a little. So right now, this WordPress multisite install is running on a $0.99 per month server. All of my tables are InnoDB, so I cut way back on any MyISAM buffers. Running mysqltuner.pl shows the maximum possible RAM usage to be 62.6 MB, about 25% of our RAM. Not too shabby. I then checked /etc/memcached.conf (since I switched from CentOS to Ubuntu) and made sure Memcached was set to only use 64 MB of RAM (-m 64). In the future, I plan to run some tests to see how much RAM WordPress actually uses in Memcached from a clean install (my suspicion is it isn’t much). Besides that, the tweaks are minor. The memory_limit in php.ini is 128M and pm.max_children = 8 for php-fpm. I have swap enabled on this VPS to allow the disk to be used for overflow. With hardly anything installed, I’m already using 2.5 GB of the 10 GB disk. Thankfully I don’t upload much on here, so this should last me for a while. The low RAM limits what you can realistically run, but it fits my needs nicely and I’ve so far been happy with it. Now don’t expect the modern design or fancy tools like you get from Digital Ocean, but if you don’t expect too much from Atlantic.net, you might not be let down. Update: It was pointed out to me that the feature set in the Atlantic.net dashboard and the Digital Ocean dashboard are very similar and, after checking out the Atlantic.net dashboard, I can say that it does have a pretty similar list of features. The main tools I use (snapshots, console access, and password resets) are all there.